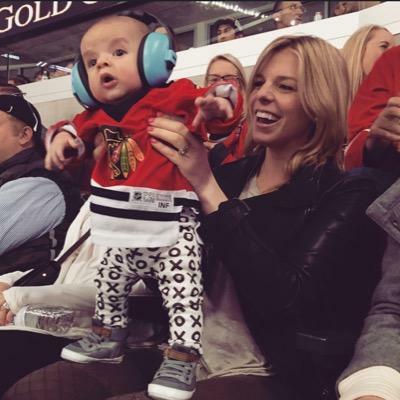 Here’s another good example of a player wife just entering motherhood and loving almost every minute of it. 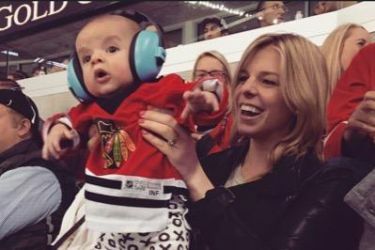 Andrew Desjardins’ wife Mandy Desjardins just recently had their son Ames in January. Major props to both Andrew and Mandy for taking their pro pregnant pictures without taking their shirts off and posing weirdly. Instead, they chose to go to some beach and just be semi-normal– posing with a goat on the sand. I’ll take a goat in my pregger pics any old day. One of my favorite videos that Andrew Desjardins’ wife Mandy Desjardins uploaded was a video of the couple cross-country driving and Andrew suffering from what Mandy coined “road rage.” It’s pretty great. It allows you to see the every-day-guyness of the fella’. 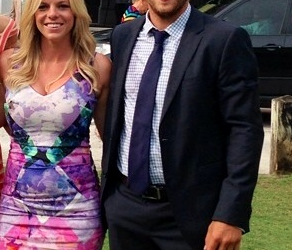 Pro athletes are just like us– especially 4th liners like Andrew! 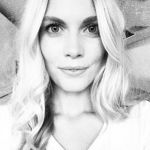 A few years ago Mandy was sort of in the habit of keeping a regular Instagram account, but I get the sense she just gave up on it when the pregnancy came. She’s not an Instragrammy type of person, but she definitely has a lot of pride in her husband’s play, and she clearly has a sense of humor about him. Another thing about Andrew Desjardins’ wife Mandy Desjardins that I like is her willingness to comment on the show The Bachelor. Her tweets are peppered with these kinds of things. They matter, people– they help observers like myself recognize the humanity. Again, you gotta’ love 4th liners and their wives. 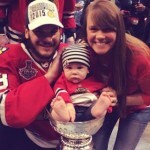 A lot of the couple’s activities revolve around her traveling to his games, and some of the best times they had with that was going to games where his parents could also attend. I’m not so sure how often that will happen now that they’ve got the kid, but it’s a fun thing you see in a lot of pro athlete couples.